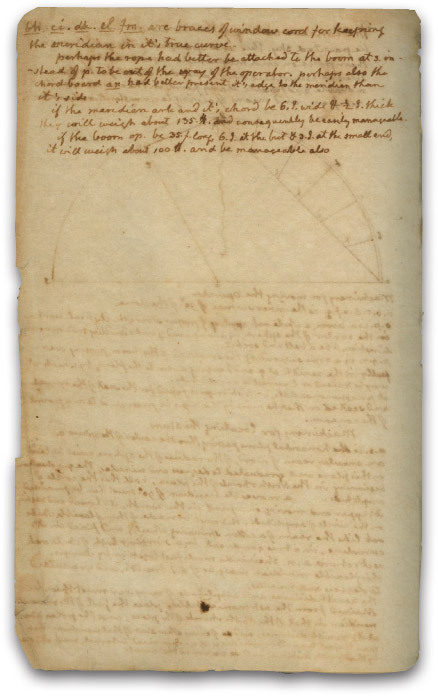 During the summer of 1818, 75-year-old Thomas Jefferson composed two remarkable pages of notes concerning his soon-to-be-constructed University of Virginia. At the center of his Academical Village, he envisioned a Rotunda dome room that would serve not as a library—as it would in the years after its construction—but as a planetarium for teaching astronomy, which he deemed the most important of the eight natural philosophies in his university curriculum. The dome's interior surface would be painted a vivid sky blue and be arrayed with constellations of gilded stars in the shape of half-spheres. Each star would be fixed to the dome's surface according to the most accurate celestial coordinates known to the best astronomers of the time. 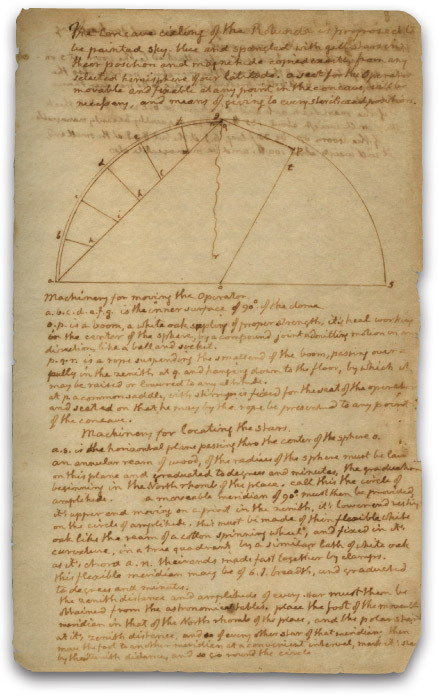 Jefferson envisioned that the dome's "concave" would serve as an oversized star chart to support this noble exercise in celestial cartography and be an integral part of the astronomy class lectures. Just how would a professor be elevated 40 feet above the floor to position each of the gilded stars on the concave? Above his narrative, Jefferson drew a diagram of a hoisting mechanism that was simple if not inspired: a common horse saddle with stirrups fixed to the end of an oak boom that would be pulled by a series of pulleys and ropes. An operator would mount it and be elevated to the dome's apex. Dangling precariously from above, the operator could pivot anywhere across the inner surface of the dome. Imagine how vulnerable someone in this saddle would have been, fully exposed to the potential mischief of the students below. No one knows why Jefferson abandoned this idea. Perhaps the hoisting mechanism was too risky an invention to construct. His subsequent notes are silent on the question. By the fall of 1818, Jefferson began another architectural drawing for the Rotunda that depicted a library within the Dome Room. His planetarium vision would never be revisited. J. Jefferson Looney, editor of The Papers of Thomas Jefferson, Retirement Series, writes that Jefferson's idea "grew out of his own abiding interest in astronomy and was central to his grand vision for the theoretical and practical study of natural philosophy at the University of Virginia. 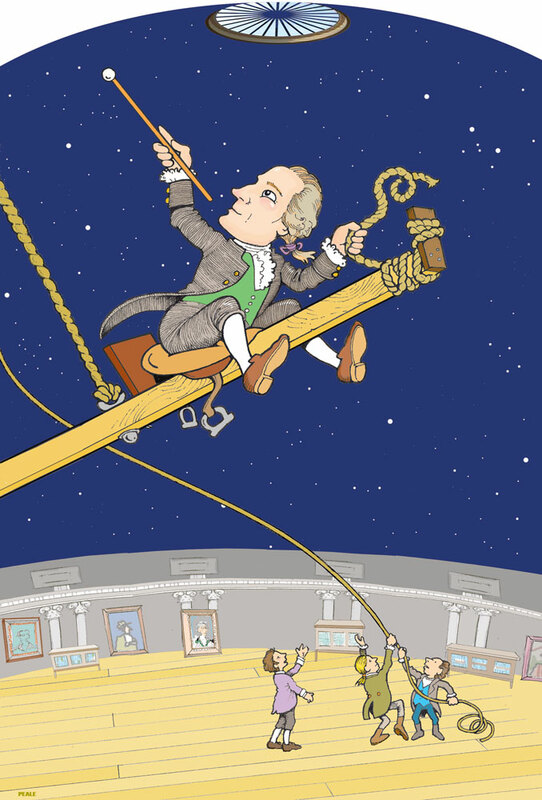 Astronomy in particular was seen by Jefferson and his peers as the culmination in the education of an enlightened man, the most direct way to perceive God … The placement of a planetarium at the highest point of the University's most imposing building would thus have had immense symbolic significance." As UVA embarks on the Rotunda's current renovation project, this may be a timely opportunity to explore creative ways to celebrate Jefferson's astronomical intentions. One can easily envision a Dome Room digital sky show, using the astronomy department's portable planetarium, depicting the known universe of the early 19th century. Or perhaps the architectural history and engineering departments could collaborate on a working model of the hoisting mechanism and celestial ceiling Jefferson envisioned. As his expansive notes reveal, the sky was never a limit in Jefferson's thinking. Harnsberger is a 2012 Jefferson Fellow at the Robert H. Smith International Center for Jefferson Studies.